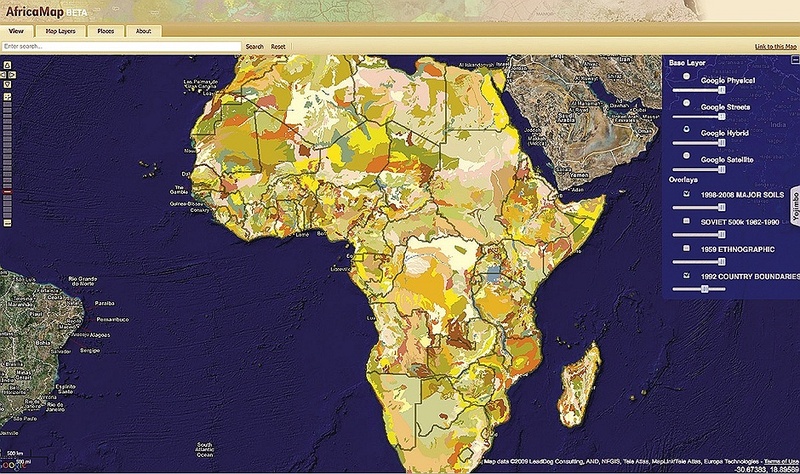 This map shows soil types for all of Africa. A researcher might use it with other map layers to study agricultural productivity among countries with similar soils, comparing, for example, the agrarian practices of Francophone and Anglophone countries. These days, maps can represent far more than geographical information. When harnessed to Geographical Information Systems (GIS), they can provide new ways to organize everything known about a place: show where power plants are located in one semi-transparent layer and compare that to population density shown in another, for example; even link to relevant datasets that can’t be represented visually. But as anyone who’s used Google Earth knows, North America and Europe are blanketed with such layers of information, while Africa remains in this modern sense “a dark continent,” in the words of Clowes professor of fine art and African and African American studies Suzanne P. Blier. No more. In December, Harvard launched Africa Map (http://africamap.harvard.edu), designed to make data about the continent easier to discover and explore. The project is one of several “Web map applications” developed with public and private financing by Harvard’s Center for Geographic Analysis (CGA; see “Hello, Geotech,” November-December 2006, page 44). Blier, who oversees an image database of African art and material culture, uses the map as both a pedagogical and a research tool. Her students can locate artwork and forms of architecture from her database in relationship to countries and ethnicities, for example (the map has layers for each of these four things). Blier can then show students a series of sculptures or masks and have them “identify where they are spatially, and hence their relationship with other works or with initiation ceremonies or the like.” In her own research, she has traced the correlates of artistic creativity by utilizing map layers containing sociological, political, economic, and historical information. But the Africa Map is not just for humanists like Blier. It is a resource that can actually “promote interdisciplinary collaboration,” says Ben Lewis, the senior GIS specialist who has brought the project to fruition under the guidance of co-principal investigators Blier and CGA director Peter K. Bol, Carswell professor of East Asian languages and civilizations. For example, as Lewis explains, “The project layer is a start at creating a map of Harvard projects in Africa, linked to researchers and actual data….” Users can “click on a particular location and find information and data for all projects which describe that geographic location, across disciplines.” It’s the sort of thing that might bring an epidemiologist studying disease transmission together with a social scientist studying the relationship between transportation and population density. Lewis has also created an index of all the Africa material in Harvard’s map collection. An enormous number of those maps, some historical, have been digitized and then “geo-referenced,” a process of assigning latitude and longitude to points on the maps. Though the index itself is already linked to the map, only one-tenth of 1 percent of Harvard’s maps have been added as visual layers so far in the ongoing project. (The process, including geo-referencing, costs $10 to $40 per sheet). Even so, Africa Map already provides “the most high-resolution, detailed maps of the continent available out of copyright” anywhere, says Blier, and more are being added all the time. Although currently focused on Africa, Lewis says the open-source, Web-based mapping framework behind the project could be used to organize information for any region of the world, large or small.